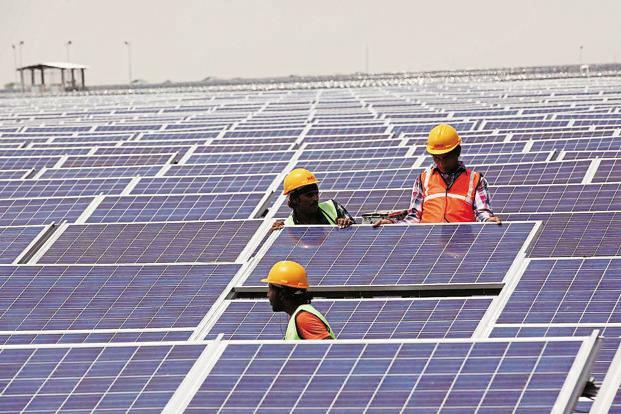 New Delhi: Indian solar power tariffs’ sharp decline will get arrested in the short term with Chinese solar module prices set to increase post the US International Trade Commission’ (USITC) recommendation on Friday. With the USITC in an unanimous vote concluding that cheap imports are hurting US manufacturers, US developers will ramp up their pace of placing advance orders to shore up cell and module supplies. This stockpiling to meet next year’s demand will lead to a price increase of Chinese modules and their limited availability for Indian developers, thereby also putting at risk projects that won licences betting on a continued decline in module prices. To be sure, once the commission submit its report to the US President Donald Trump by 13 November post a 3 October public hearing, the final decision will be taken by Trump himself, whose presidential campaign and term has been built around growing American manufacturing. “The US International Trade Commission (USITC) today determined that increased imports of crystalline silicon photovoltaic cells (whether or not partially or fully assembled into other products) are being imported into the United States in such increased quantities as to be a substantial cause of serious injury to the domestic industry producing an article like or directly competitive with the imported article,” the US agency said in a statement. “The President, not the Commission, will make the final decision concerning whether to provide relief to the US industry and the kind of relief to provide, including with respect to imports from FTA (free trade agreement) countries,” the statement added. If the US President does decide to impose protectionist measures in the backdrop of US’s withdrawal from the Paris climate agreement, then the solar equipment prices will fall. This will help India’s plan to add 100 gigawatt (GW) of solar power capacity by 2022. Modules account for nearly 60% of a solar power project’s total cost. Of China’s solar module manufacturing capacity, estimated to be around 70GW per year, the major markets are the US, India and China itself. Interestingly, India is also conducting an anti-dumping investigation on solar equipment from China, Taiwan and Malaysia. Any price fluctuation in Chinese equipment cost has a significant impact on the Indian clean energy space given that most developers here have been sourcing modules from countries such as China, where they are cheaper. According to consulting firm Bridge to India, the Indian solar module market is dominated by Trina Solar (25.7% market share), Hanwha (10.5%) and Risen (7.6%), with domestic manufacturers’ accounting for only 10.6% market share. Experts say the US agency’s recommendations have been on expected lines. “(It is) still not a clear case for duties because technically the USITC recommendation could be different to save jobs and the downstream industry. Nonetheless, in short-term, module demand and prices will shoot up, which will hurt Indian project pipeline. If the duty is imposed, prices are likely to fall significantly next year,” said Vinay Rustagi, managing director at Bridge to India. The early tremors of the landmark petition have already been felt in India, which is the world’s third-largest energy consumer after the US and China. Mintreported on 24 August about Chinese module manufacturers reneging on their contracts and demanding an upward price revision to supply the equipment already contracted for. Major Chinese solar module manufacturers include Jinko Solar, JA Solar Holdings, ET Solar, Hanwha Group, Chint Solar, GCL-Poly Energy Holdings Ltd and Trina Solar Ltd.
Module prices have also firmed up with China extending the feed-in tariff regime, which ensures a fixed price for power producers, for the third quarter. India’s record low tariff was Rs2.44 per kilowatt hour (kWh) in May. Tariffs since then have firmed up with the auction conducted in Gujarat this week witnessing the lowest winning bid of Rs2.65 per kWh. In such a scenario, Indian developers don’t have much of a choice apart from awaiting the final US play and trying to read the tea leaves. This entry was posted in Cells & Modules, China, Crystalline, India, PV, Renewables, Solar and tagged anti-dumping duty, CSun, India, India Solar, JA, Jinko, Longi, PV Panels, Solar India, Solar PV, Suniva. Bookmark the permalink.